Carat weight is the standard unit of weight for diamonds on other gemstones, which is measured on an electronic scale and rounded to the nearest hundredth of a carat. While two diamonds can be of equal-carat weight, it should be noted that one might be evaluated at a higher value due to its cut, color, and clarity. If your diamond is not certified and is still set in jewelry, you will either have to remove it or calculate an estimated carat weight. Appraisers often measure the diamond and use diamond weight calculations to figure the carat weight. This always involves estimations and in reality some guesswork. When dealing with expensive diamonds, estimating the carat weight is NOT a reliable way to determine the highest sale price possible for your diamond. The best way to calculate the actual carat weight of a diamond is to remove the diamond and weigh it loose on a calibrated scale. A diamond report or certification will provide the accurate carat weight. Diamond prices are determined per carat and broken down into price brackets by their carat weight. The ranges of carat weights are separated into different price brackets with varying prices related to the combination of the diamond’s color and clarity. The brackets range from .01 to 10.00 ct plus. 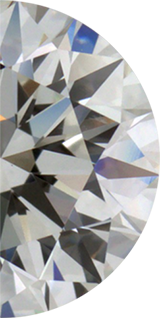 The Diamond Trade is a specialist in buying large diamonds. We pay a premium for diamonds above 2.5 carats. 0.90 ct 1.00 ct 1.50 ct 2.00 ct 3.00 ct 4.00 ct 5.00 ct and so forth. When a diamond is on the bottom of a particular price bracket (e.g. 3.00 ct), one point (.01 ct) below will take it to a lower price bracket and lower per carat price. So two diamonds equal in cut, clarity, color that have one-point (0.01ct) difference in weight can make huge price change and cash offer for a diamond. A 3.00 ct Round Brilliant Diamond, F in Color and VVS2 in Clarity with Excellent Proportions could be valued up to 20% to 50% more than a 2.99 ct Round Brilliant Diamonds, F in Color and VVS2. On paper and in-person they may appear the same, but the one-point difference can make a great deal of difference in per carat price and total price of each diamond. Second hand and recycled diamonds regularly require re-cutting, due to condition and/or marketability, and the issue of dropping below the “magic number” will determine the dollar amount you will be offered for your diamond that has an issue with its condition.